Lise Whitewolf and Donna Chiarelli have been reaching out to their neighbours, their community associations and local politicians to try to improve the safety of their streets. Photo by Anita Grace. The residents of Wellington West have an important message they are trying to communicate to the many drivers zipping down their streets: Slow down! We live here! Lise Whitewolf and Donna Chiarelli both live near Scott Street and report there’s too much traffic in their neighbourhood, and it’s much too fast. “It’s over the top,” says Whitewolf, who has witnessed several accidents and countless near-misses. “People are coming off Scott Street really fast,” echoes Whitewolf. “Cars have jumped up on the sidewalk and fishtailed on dry pavement.” Just last month there was an accident at Ross Avenue and Scott Street that pushed a car up on the sidewalk, right in front of a home where a 15-month-old toddler lives. “I’m scared to have my kids on the sidewalk,” says Whitewolf. Click image to enlarge. Lise Whitewolf made these signs one night when she could not sleep after witnessing yet another accident close to her home. “I am just doing anything I can think of,” she says. Photo by Anita Grace. Fueled by frustration and fear, both Whitewolf and Chiarelli began reaching out to their neighbours, their community associations and local politicians to try to improve the safety of their streets. When they did not get any help through formal channels, they took matters into their own hands. 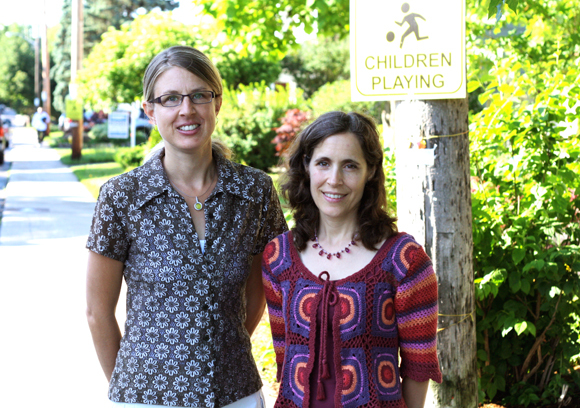 Last summer, Chiarelli and her neighbours engaged Agent Signs, a local company on Harmer Street North, to make bright yellow signs that read “Slow: Children Playing.” Whitewolf says that the signs seemed to make a difference at first but the problems have not gone away. Whitewolf, Chiarelli and other neighbours applied to the City of Ottawa’s Better Neighbourhoods program, which provides funding of up to $30,000 for small-scale community projects. The aim was to create a pilot “slow zone” that would use basic, cost-effective tools like signs, crosswalk painting and planters to encourage drivers to slow down at corners and intersections. Despite having support from the Wellington West BIA, Wellington West Community Association and from Councillor Katherine Hobbs—as well as more than 200 signatures gathered in just five days—the application was denied. “I’ve been really frustrated by the whole thing,” admits Chiarelli. After having invested hours of her time, she feels that no real improvements are forthcoming. Whitewolf, however, saw some improvements on her street after there were two accidents in as many days at the intersection of Ross Avenue and Scott Street. On May 22, barrels were put up on Scott Avenue to prevent cars from turning onto Ross, and on June 4 the City began painting 30 km/hr signs on the pavement.